13 March 2018, Arusha, Tanzania: H.H. 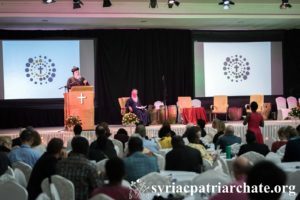 Moran Mor Ignatius Aphrem II, Patriarch of Antioch and all the Eaar, the supreme head of the Universal Syriac Orthodox Church speaks during the Embracing the Cross plenary. From 8-13 March 2018, the World Council of Churches organizes the Conference on World Mission and Evangelism in Arusha, Tanzania. The conference is themed “Moving in the Spirit: Called to Transforming Discipleship”, and is part of a long tradition of similar conferences, organized every decade. His Holiness Patriarch Mor Ignatius Aphrem II participated in the closing session at the Conference of “World Mission and Evangelism”, organized by World Council of Churches (WCC) in Arusha – TANZANIA. At the end of his speech, His Holiness reassured that “the Church today is faithfully embracing the Cross of Christ, and follows Him to the Calvary trusting that, from death, life is given in Him.